This is the second in our short series of items on curiosities or rarities seen at this year’s Beaulieu Autojumble. 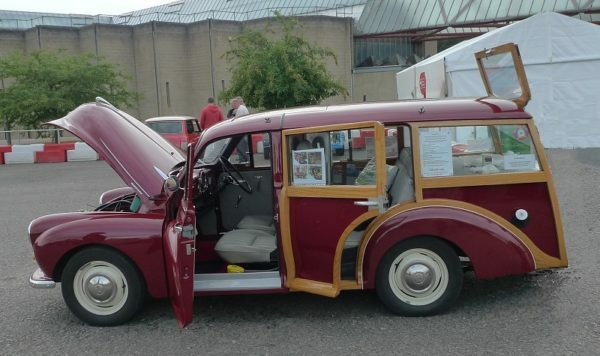 At first glance, this may appear to be a perfectly standard 1956 Morris Minor Traveller – and there’s nothing wrong with that. However, a closer look reveals that it is a totally unique vehicle, re-bodied in the Morris factory in period. The current owners believe that the original purchaser wanted a Traveller specifically designed as a ‘Shooting Brake’ in the true sense of that phrase. It was therefore returned to Morris Motors to be rebuilt on an extended commercial chassis. The detailed Morris drawings are still with the car. We can see that there is an additional rear passenger door – but on the nearside only! Various theories have been put forward for this asymmetrical design – including the concern that two people exiting the car with loaded shotguns on both sides at the same time could be dangerous. Then why not leave the shotguns, unloaded, in the load area? Any ideas would be welcome. Just goes to show that nothing is new. When the estate version of the BMW Mini was introduced, they only had one rear side door and we all thought “that’s novel”.